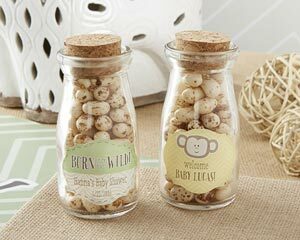 It’s a jungle out there with the many party favors options, but personalized milk jars by Kate Aspen are sure to be a hit. Customized for the baby shower, these safari-inspired pieces are great as drinkware during the party or as guest favors filled with sweet treats. They’re born to be wild!